There was a very large moon scheduled for the 0:48UT on the 30th, according to the calendar. This made it seem quite reasonable to head out late on the 29th for a bit of moon watching. Perhaps some star gazing too. We chose to try for De Vore campground but the guidebook (1994) noted that the road on the map (1995 and still the one sold) was closed and this would probably be permanent. A little investigation confirmed this. Also there would be toilets and no water. We weren't really looking for much of a hike, though. Just a stroll in and out with stars and the moon in the middle. 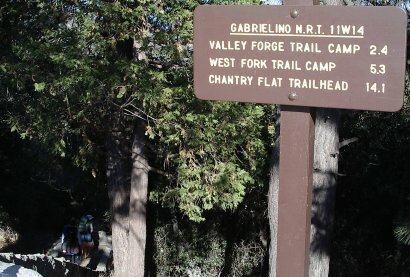 So, even though De Vore is supposed to be one of the 10 best campgrounds in LA (according to some Gorp listing) and the next one up, West Fork, not quite as good but still very nice, we decided to stay at Valley Forge, the first campground along the long closed road. It's got a nice historic ring to it, anyway. We drove up to Red Box late in the day, getting there around 5:30PM and headed for the trail. From Red Box, both the road and the trail go to Valley Forge, but the trail requires a turnoff that, as far as we know since we haven't been there, might be easy to miss. The guidebook implied that it was, so we chose to go down the road to get there. At Red Box, there is a stairway down to the trail that heads left to points unknown and right to the road. Points unknown turned out to also be the road, just a lot further down. The sign at the trailhead, which doesn't note the distance by the road or agree with later signs. Sarah (in front) and Abbie (in back) are already on their way down the stairs. My mother and I decided to hike up Jesusita to Inspiration Point. 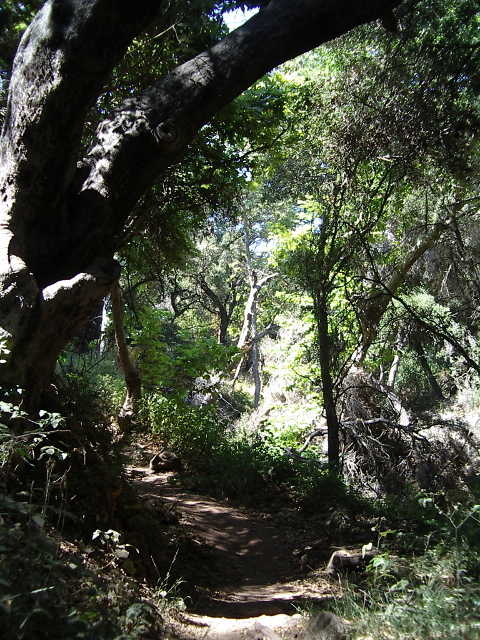 There is no actual Jesusita trailhead, it connects Arroyo Burro to Tunnel at points very close to the trailhead of each of those. I think that's how it works, anyway. It might share Arroyo Burro for a bit instead. We decided to go up from the west side at Arroyo Burro where parking is generally easier and the route is longer. Also, my mother seemed to be worried about dive bombing mountain bikers that are apparently more common on the other side of the trail which has some very fun steep sections. A bit of shade at the start of the trail. Looking out over the ridges and trail and power lines. 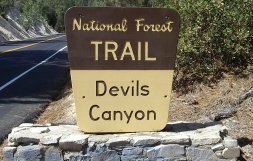 Here be Devils Canyon. Well, on down the trail a while, actually. Devils Canyon! Um, trail. The actual canyon is at the end of the trail as most of it is going down a tributary. 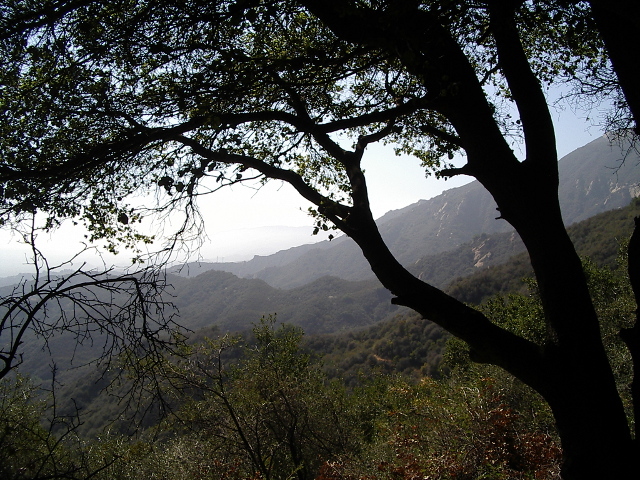 And so we headed out into the San Gabriel Wilderness. Also we met our first set of backpackers. 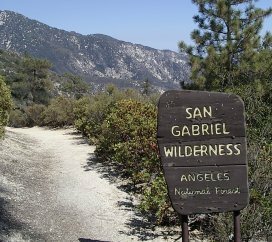 The San Gabriel Wilderness starts just the other side of the road from the parking.